"Get One Of The Most Powerful Self-Improvement Courses That Have Inspired Millions Of People Around The World To Be Successful -- For *FREE*!" If you have not heard of "As A Man Thinketh", then you're missing out a powerful course that can literally change your thought process to achieve success in life. In fact, even the world's #1 success coach, Anthony Robbins had mentioned As A Man Thinketh in one of his courses. Instead of reading the book, I'm going to give to you a FREE As A Man Thinketh MP3 Audio Course CD with no string attached. - Find out how circumstance does not make a man but how it reveal him to himself because Men do not attract that which they want, but that which they are. 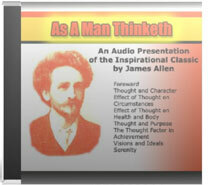 Special Bonus When You Request For Your FREE As A Man Thinketh MP3 Audio CD Today! You'll get the digital copy of the audio course transcript upon confirmation. Strong, pure, and happy thoughts build up the body in vigor and grace. The body is a delicate and plastic instrument, which responds readily to the thoughts by which it is impressed, and habits of thought will produce their own effects, good or bad, upon it. This is the real famous classic of the "As A Man Thinketh" material. It's the complete course and you're getting this with no-string attached. So if you're wondering why in the world I'm doing this ... there are many reasons to it. First, I think this course will definitely help you become more successful in life and I simply wants to share it with you. Secondly, the more value you're getting from me, the more you'll appreciate the products that I've created and be creating. Thus, it'll be easier to get you to become my future customer (At least I'm being honest!). It's business sense. But for now ... I got nothing to sell to you in the audio course. It's all packed with pure, rich content in this CD. YES Patric! Rush me the FREE CD of 51-Minute As A Man Thinketh MP3 Audio Course. I understand that I can get this CD absolutely FREE while the offer is still available! IMPORTANT UPDATE: Due to the overwhelming response to this offer, I can't guarantee how long this offer can lasts. It could end at any time. Obviously I can't keep on continuing to give a free CD away forever. I've ordered 1,000 CDs only. Once all of these are sent out, I'm not sure when is the next batch will be ready. I'm sorry to say that I'll have to put you on my "stand by" list if this happens. So don't miss it! Request for your FREE CD NOW. Please note: There will a nonrefundable $5.95 for shipping and handling fee when you request the CD for free. This is so that I don't need to take out money from my own pocket to give you this valuable audio course. You will only pay $5.95 for shipping and handling. P.S: Imagine what can one of the most powerful self-improvement courses impact your life -- Obviously to be more successful in whatever you're doing. The WHOLE audio course is yours free. You just need to pay the handling and shipping cost incurred to me. That's fair, right? Get it now. "I Want To Share With My 2 Of My Friends!" *Note: After you have invited your friends, you'll be taken back to this page. Copyright 2006 by Patric Chan All Rights Reserved.